The Great Northern Diver was still present today, and three Little Egrets were in Villice Bay. No sign of the Red-throated Diver today, but a Great Northern Diver has appeared in its place. It (presumably the same bird) was seen in flight over CVRS last Sunday morning, but it was seen to fly off west. The two Little Egrets were still in Villice Bay. The oiled Red-throated Diver remains - today it was mostly off Moreton hide. It now has a brownish head (on the right side) where it has been preening the oiled part of its right flank. Most of the other good birds were in Villice Bay, where the shallower margins have pulled in a good number of birds, today including two Little Egrets, the drake Red-breasted Merganser (now in full plumage) and a Green Sandpiper. At least 29 Goosanders were seen today, plus a couple of adult Mediterranean Gulls in the roost. A pair of Stonechats was at Heron's Green Bay/Nunnery Point. A Red-throated Diver was an unexpected find in Stratford Bay this afternoon - sadly the bird is heavily oiled down its right flank and on its belly. Other birds seen today included a Mediterranean Gull and two Kingfishers (Nunnery Point and Stratford Bay). The water level is now creeping back up after all that rain last week. No sign of the Lesser Scaup today, but six Greater Scaup and ten Little Egrets were both noteworthy counts. The 'false Redhead' was today replaced by another hybrid - only this one is a more obvious Pochard x Ferruginous Duck (probably) - this bird was first seen yesterday. A much cleaner-looking bird than the one on Saturday afternoon, with quite a rufous-toned breast. Thanks to Richard Mielcarek for the photos. Two Woodcocks were seen today - November seems to be a good time to catch up with these surprisingly uncommon birds at Chew. I've uploaded some images of the Chew/Greylake Glossy Ibis (taken at Greylake) - click the link on the homepage. Two or three Water Pipits were seen in flight around the SE end of the lake, and a Black Redstart was seen at Herriott's Bridge early this morning (a good local patch bird) - sadly it could not be relocated later. The drake Lesser Scaup was present again today with three Greater Scaups. Funny how 'our' Greater Scaups can happily fly over to Blagdon but their Lesser Scaup can't be arsed to come over here. A drake Common Scoter was present today. A female Common Scoter was in the centre of the lake this morning, and a flock of 16 Wigeon were also seen flying around the lake. A Jack Snipe was seen between Stratford and Moreton, along with 13 Snipe. Other birds seen today included single Redpoll (Nunnery) and Brambling (Moreton), an eclipse drake Red-breasted Merganser, four Chiffchaffs and at least four Kingfishers. Fourteen Goosanders were in Heron's Green Bay this afternoon. Little else to report other than another large Starling roost this evening at Herriott's Bridge - there must have been up to 20,000 birds present. Not exactly biblical proportions, but good numbers for Chew. 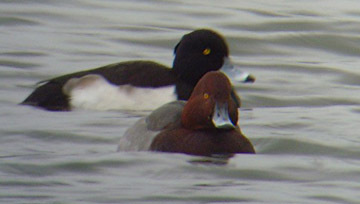 The drake Ferruginous Duck was again in Stratford Bay, along with one of the drake Aythya hybrids. Two Green Sandpipers were on the main dam, an adult Peregrine was at Sutton Wick this morning, and a Jack Snipe was in Heron's Green Bay on the spit below Moreton Cottage. A first-winter Kittiwake was seen today; also a Green Sandpiper on the dam and a Dunlin flew through. 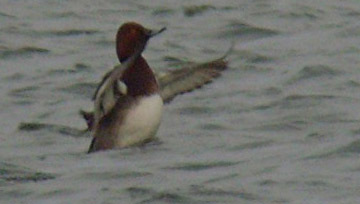 One of the drake Aythya hybrids was at Stratford hide. A quieter day - a second-winter Yellow-legged Gull on Herriott's Pool this afternoon was the only report of note. The Pied Wagtail roost at Herriott's Pool this evening held c.300 birds. There was still one Migrant Hawker on the wing in the sunshine today, and the 'evil' Harlequin Ladybird was discovered at Villice Bay this afternoon - the first Chew record. Just when everyone stood on Herriott's Bridge at first light thought they'd dipped, the Glossy Ibis was relocated in the emergent willows in front of Stratford hide - it gave great views at close range for about ten minutes (not that you'd tell from the photo) until it flew off over Herriott's, then back again, landed on the pool for a couple of minutes, then took off SE never to be seen again. At least not until it landed at Catcott Lows at 11:45. Another Chew tick for all who saw it, in what has become a very peculiar autumn. Rarity-wise, three great birds - Spotted Sandpiper, Cattle Egret and now the Glossy Ibis, but general migration has been probably the worst ever. In fact this autumn there have been more Spotted Sandpipers than Ruffs at Chew, and well-known bird-spotter Keith Vinicombe has failed to see a Black Tern for the first time ever. A few other sightings - a first-winter Kittiwake in the dispersing gull-roost over Herriott's Bridge just after first light, two Greater Scaups (off the mouth of Heron's Green Bay), a Green Sandpiper, a Lesser Redpoll, two Yellow-legged Gulls, the first-winter Little Gull and two Water Pipits (in flight over Stratford hide). A rather sickly Daubenton's Bat was found in a grass verge this morning and taken into care. Another quality rarity - a Glossy Ibis this afternoon was a first for Chew, and the first documented record for 'Avon'. It was seen briefly on Stratford Islands, then in flight past Stratford hide, after which it again vanished, only to be relocated on Stratford Islands at 17:25, after flying in over Herriott's Bridge. The first-winter Little Gull and two Greater Scaup remained.